Free to be me...whoever "me" might turn out to be. This has always been the deepest desire of my heart. From the sidelines of life, I stood watching the rest of the world march to the beat of its own drum while aimlessly stumbling around in the dark to hear the beat of my own heart. Everyone else seemed to have it all together. Everyone seemed so confident in who they were, in what they were doing, in living their life. Nothing in my life felt normal or comfortable. Don't get me wrong. I grew up in a beautiful family. The trouble with me, was....well.....in me! My search for me has been a long, lonely, and often, frustrating journey. It's not easy lugging around heavy suitcases laden with insecurity, fear and a whole lot of other "unmentionables" day in and day out. My search for me has led me on many "goose chases", too. After all, I was looking for me. Me was searching for I. Talk about spinning in circles and getting nowhere. But then, God stepped in. From a prayer spoken in my heart, God started leading me on a path of self-discovery. As I began to search for God, little by little, I began to see glimpses of the real me; the me God created me to be. I began to see myself through the eyes of my creator. I began to realize that the emotions I feel, along with my personality, my talents, all 5 feet nine inches of me was intentionally, meticulously, lovingly crafted by God. AND...in His eyes....it is good. I am good. 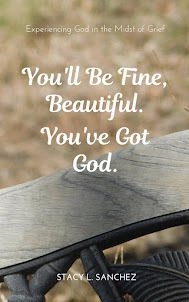 Not good in myself, mind you, but good in the undeniable truth that God does ALL things well! Any accomplishment I achieve, any award I win, any head I might turn, has nothing to do with me and everything to do with my Heavenly Father. It is He who has created me and it is He who is at work through me. I can't be boastful about who I am. Any "peculiarity" I have, any idiosyncrasy I have, any distinction I may have, has nothing to do with me and everything to do with my Heavenly Father. It is He who has created me and it is He who has made me who I am. I can't be embarrassed about who I am. I can simply be who I am. The balance for my life is found in Christ. The answer to who I am is found in Christ. The answer to why I was created is found in Christ. I'm no longer concerned about fitting in or joining the "human band". While others continue marching to the beat of their own drum, I have found the harmony of my life in Christ. As long as I am marching to the beat of God's heart, I know who I am. Free to be who God created me to be. Free to march to the beat of God's own heart. What could be more freeing than that? hi, stacy! love it, as usual. so well said. i love where you said to walk to the beat of God's heart. you are using your gifts! I think self discovery is a tricky thing. The world teaches us that is about discovering who WE are and what WE can do, but we know it's about who He is and what He wants to do through us, which includes the gifts and talents and special unique things He's given us. I'm so glad you're allowing Him to use you and gifts and talents. Thank you always for your encouraging words. You are such a blessing to me. I'm so happy to be sharing the journey with you, my friend. That's wonderful freedom Stacy. To live without being afraid of who we are but secure in knowing God's gracious fingerprints have marked us is a gift!